Join the Roulant Roots! Become a monthly donor and nourish your community all year long! Stabilizing, sustaining and nourishing, the Roulant Roots are a foundation upon which we can grow and flourish. This spring, we ask you to nourish your community by becoming a monthly donor! Above: Watch a short video featuring two current monthly donors, reflecting on what the Roulant means to them. Thanks to Tom Wity for the video. 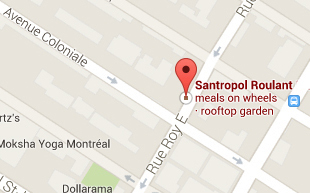 Help us offer Montrealers good food and human contact! Every week, we deliver 500+ meals to individuals living with a loss of autonomy with the help of 1400 volunteers a year who grow veggies in our gardens, cook food in our kitchen and deliver meals to our clients’ doorsteps. for an individual living with a loss of autonomy, filled with veggies we grow, and delivered to the client’s doorstep by caring volunteers. Plan ahead! Steady revenue allows us to plan activities all year long. Respond to emergencies, like a bad harvest or a broken fridge. Diminish our fundraising costs, which allows us to focus on our work. This spring, join the Roulant Roots, our monthly giving program and build a strong and well-fed community.